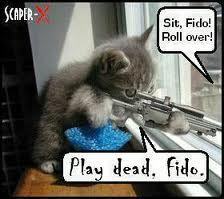 Sniper Kitty. LOL, found this while looking for something on 谷歌. Wallpaper and background images in the 小猫 club tagged: cute kitten. Yes and my cousin's 12 week old balanesekitten is stunningly beautiful! !